Why choose Loxan Samsung Gear S3 Watch Band? Professional manufacturer offers premium material and products with reliable quality and excellent technology. Use first layer leather, we promise all products are made of 100% calf genuine leather, give you ultra-silky feel. Use waterproof inner material; it can prevent the leather eroded from the sweat. Check each item during the production line, especially for the firmness of collars and buckles. Use the real Samsung Watch to check each band whether fit or not. Exquisite packaging, effectively prevent the item to be damaged in transit. 24hrs dedicated E-mail support for customers. Leather is a natural product, so you may take more care and pay more attention to it over time. The genuine leather watch band is supposed to be laid in a cool dry and ventilated place, and do not prolonged periods of exposure to direct sunlight or exposure to wet conditions, in this way, it could extend the lifetime of the band. To clean, wipe with a soft cloth, or dip a soft brush in warm soapy water and gently rub the band clean. A damp cloth may be used for a more thorough cleaning. 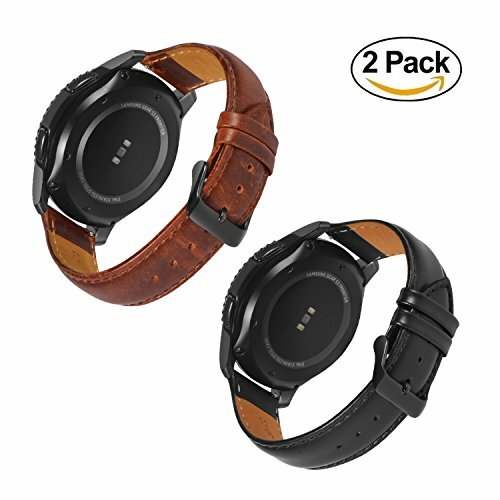 Excellent design: Loxan replacement watch band with QUICK RELEASE PINS inside for Samsung Galaxy Gear S3 Frontier / Classic, Gear 2 R380/Neo R381/Live R382, Moto 360 2 46mm, Asus ZenWatch 1 WI500Q/2 Men 1.63''WI501Q, Pebble Time/Steel/Classic, LG G Watch W100/R W110/Urbane W150, Huawei Watch 2 (Classic), Vector Luna/Meridian, Ticwatch 1, Fossil Q Founder Gen 1 2/Marshal/Wander/Crewmaster/Grant, Cookoo Smart Watch. Work with any 22mm designated watch. Easy to replace or exchange your watch band. Fits 6.1"- 8.1" (155mm-205mm) wrist. 12 months no-hassle warranty . Accept return if you are not happy with the quality. Please feel easy to order it. If you have any questions about this product by Loxan, contact us by completing and submitting the form below. If you are looking for a specif part number, please include it with your message.